The living cell has amazing structural organization. At a first level, this is obvious from the many distinct sub-cellular compartments at specific locations within every tiny cell (e.G. The nucleus, Golgi, mitochondria). Many of these compartments are specialized factories, each with its own assembly line requiring specific raw material as input and generating specific products. A constant give-and-take of materials occurs between these factories inside the cell, because each factory is dependent on the other to function. In the big picture of things this incessant exchange of material keeps the factories of the cell functioning, which in turn is what keeps us alive. This flow of material occurs in a highly regulated and disciplined manner, so that the right things are present at the right place and time. How does this transport of materials take place? This is where the army of tiny machines called molecular motors comes in. The cell has a network of roadways (one kind of roadways are called microtubules, see Figure) with heavy traffic of molecular motors on them. These motors can be thought of as porters ferrying all kinds of material within the cell. You will be surprised at how well this analogy of molecular motors with porters works, but dont forget that these motors are a 10-million times scaled down version of what your idea of a porter is. So, what exactly is this motor that works on a molecular scale? One example is a protein with two legs walking along on the cellular roadway, stepping just like a porter and carrying some cellular material as cargo. During every step that the motor takes, it has to generate force and therefore does some work. The energy required for this comes from chewing up a molecule called ATP, which has energy stored in its chemical bonds. For every step that the molecular porter takes, it needs one little packet of energy in the form of an ATP molecule. So, if you travel inside the cell and need somebody to carry your bags, make sure you give them a constant supply of ATP. Just three meals a day does not work at the molecular scale. 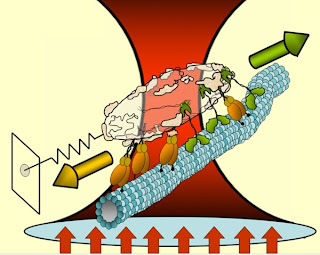 Kinesin, one of the best studied molecular motors walks with precise steps of 8 nanometers. For each step, kinesin uses one molecule of ATP and generates 6 piconewtons of force. A simple calculation shows that this makes kinesin a nano-machine with almost 50% efficiency, which is comparable to many machines of human design. To give you an idea of the magnitude of scales here, if a kinesin motor walked upwards starting at your toenail, it would take about 100 million steps to reach your nose. Approximately 1 million-million kinesins would have to team up together to arm-wrestle with you and have any hope of winning. We are really talking nanotech here. For anyone impressed with kinesin, there is more to come. Dynein is a second class of motors ferrying cargo within the cell, and is much more complicated than kinesin. There is recent evidence that nature has implemented a nanoscale gear mechanism within this complexity. It appears that dynein normally walks with a step size about thrice the size of kinesin. However, if you pull dynein backward the motor can shorten its stepsize and resultantly produce more force, which is just like shifting gears in your car on an uphill road. Only future research can tell why nature felt the need to implement such complex architecture at these minute size scales. There are many other classes of motors which I have not discussed here for reasons of space, and also to keep the discussion simple. One common theme that has emerged from years of research is that of surprisingly intricate and robust architecture within these molecular motors at a size scale which we are only now beginning to comprehend. It is these little things in life that matter, so let us congratulate nature on a little job very well done ! !